I was just about to lay down $170 for a compost tumbler, but after seeing them up close, I knew there had to be a better and cheaper way (for a tumbler... not just a pile 🙂 ). One of the first hits on youtube was this guy's home made tumbler. Looks nice, and offers the most interesting ventilation system which seems like it would beat all the store bought alternative. He offers up the plans for his tumbler. I'm going to have plenty of materials compost from the yard and kitchen, so I decided I wanted two tumblers, and figured I could modify these plans accordingly. 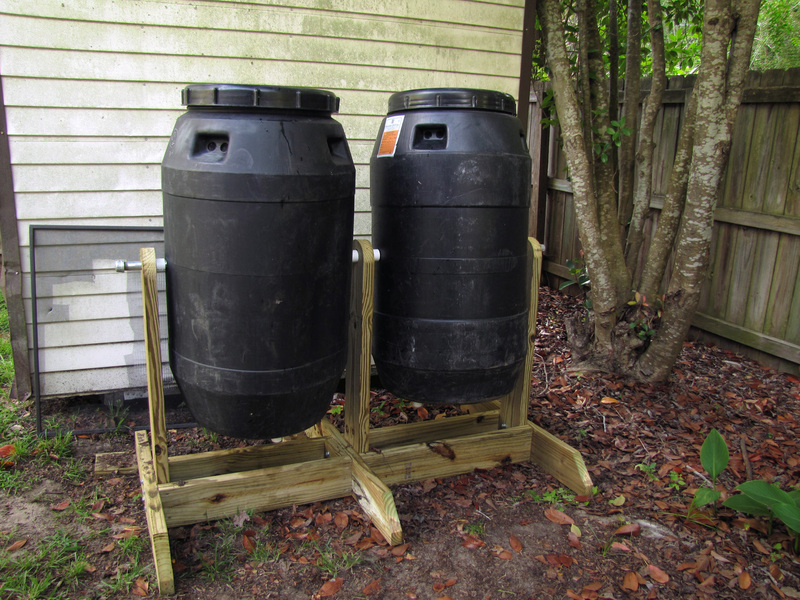 I found a person on craigslist selling those exact same barrels for cheap, so I picked up 2 (plus another one for a rain collection barrel). Stratman4u's plans are comprehensive. I printed them out and went to Lowe's. Bought everything almost verbatim, but doubled or lengthened up where needed. 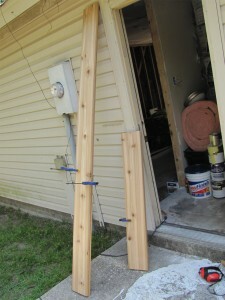 Cut all my 2x6 lengths, and began bolting the feet and uprights together. Modifying the plans to make a dual stand was fairly simple, and the only major change is the center upright/foot joint. I added some extra wood so that everything could be fastened together. This is how I laid out the center foot/uprights. Long bolts will go through those three pieces in the center, and deck screws will fasten the center braces to everything. The completed, dual compost tumbler stand. A 60" threaded pipe is almost a perfect fit. 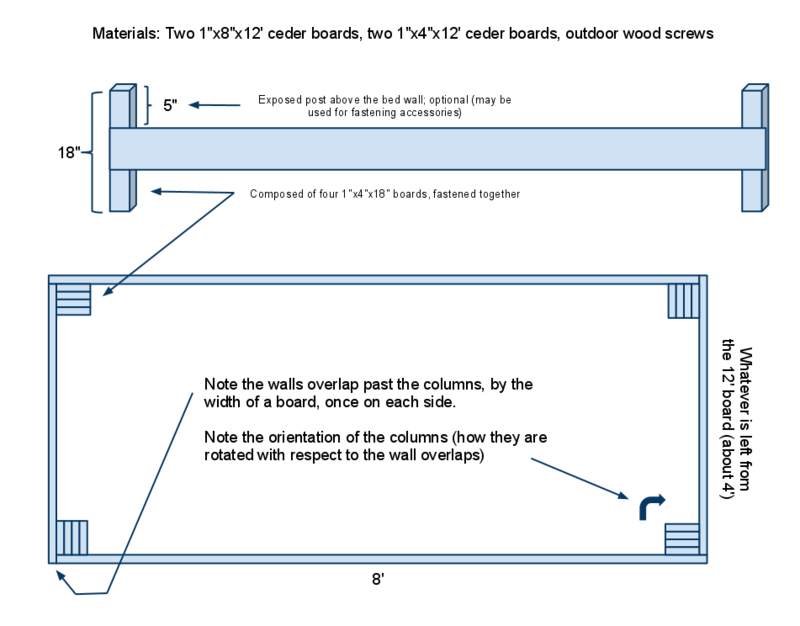 Find the mold seam in the barrel that bisects it through the plane in which your axle will reside. Your hole will line up perfectly. Go ahead and mount the closet flange. I used short, outdoor wood screws (the barrel plastic is thick... they will hold well). Insert the 3" pipe at the "half way" point in the flange, so you can go further in, or back out, to line up the axle holes you drill. Mark where you think they should be, and drill them. I used a two part epoxy for any gluing. Various stages of piping the barrel. I used electrical tape to hold the screen on while the epoxy dried. My total cost was around $100. I'm pretty happy with the cost because I now have two tumblers, and the venting on these is so much better. For getting the compost out of the barrels, I figure I can throw a tarp underneath, and then drag it to wherever I need it, or if I need only small amounts, a 5 gallon bucket. My dual compost tumblers. The left one is already going. My wife and I just randomly bought some clearance vegetables from Lowe's one day and planted them straight into the backyard with a pine border. Fast forward a month, and I'm bit by the gardening bug. I'm not even a big vegetable fan... but damn, I want to grow them! Expanding upward allows for even more awesome soil without excavating the backyard. Accessories: I haven't done any yet, but I plan on added pest protection and automated watering. The raised bed allows for these to be neatly installed. Left: Old bed. Right: New bed. Longevity: I'm hoping the use of cedar will allow this bed to last more than a couple seasons. Till as deep as I can in the area of the bed. 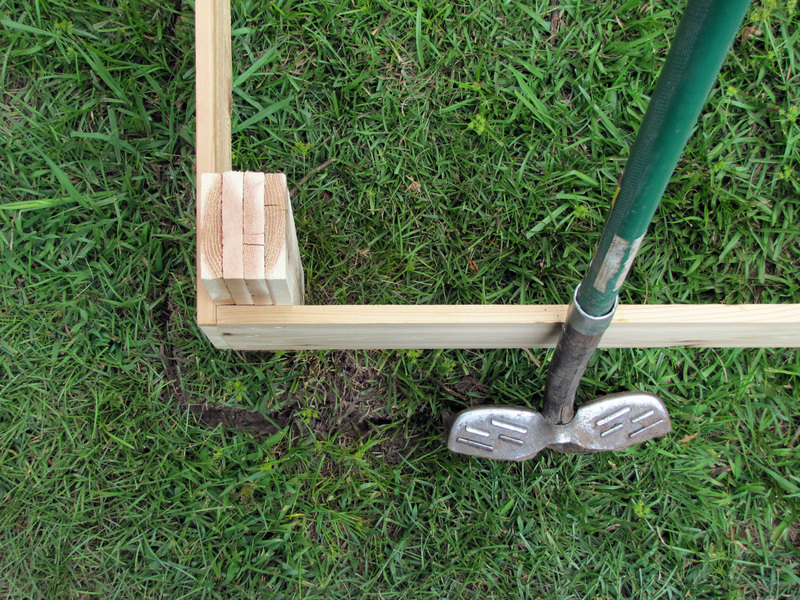 Bury the side walls a few inches deep to prevent the surrounding lawn from spreading to the inside. Fill and top it off with a combination of my soil, extra top soil, compost / manure / fertilizer. Transplant the grass that is being removed to another section of the yard that needs it. Used cedar because it is a naturally rot resistant wood. Extended the columns / posts past the top of the walls so I can use them for accessories I add later. Did not attach hardware mess to the bottom of the bed. My bed isn't that deep, so the root systems will extend well beyond the bed's depth. However, if I increased my bed depth and wanted hardware mesh, I would attach it to the completed bed before installing it into the ground. 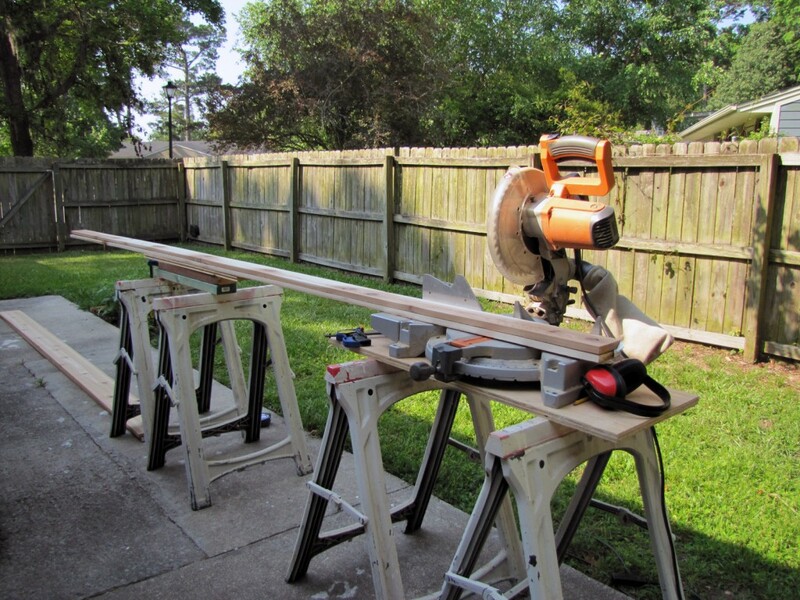 View the image below for a quick overview of how I planned on building the bed. By using these measurements I was left with no scraps. First thing to do is to make the columns. I would have loved to use a 4x4 cedar post for this, but other than a pre-built mail post, the local home improvement stores do not have cedar posts. The only cedar they carry appears to be designed for siding, so they are never thicker than 1 inch. My compromise (I still wanted all cedar) was to "make my own post" by fastening four 1x4 segments together. NOTE: My plans call for 18" lengths... well that doesn't quite work. The material removed by the with of the saw blade, after so many cuts, is great enough to make your last few segments shorter than 18". I'm OK with that... the bottom of one of my post was a little uneven, but I made sure to make that the buried part. 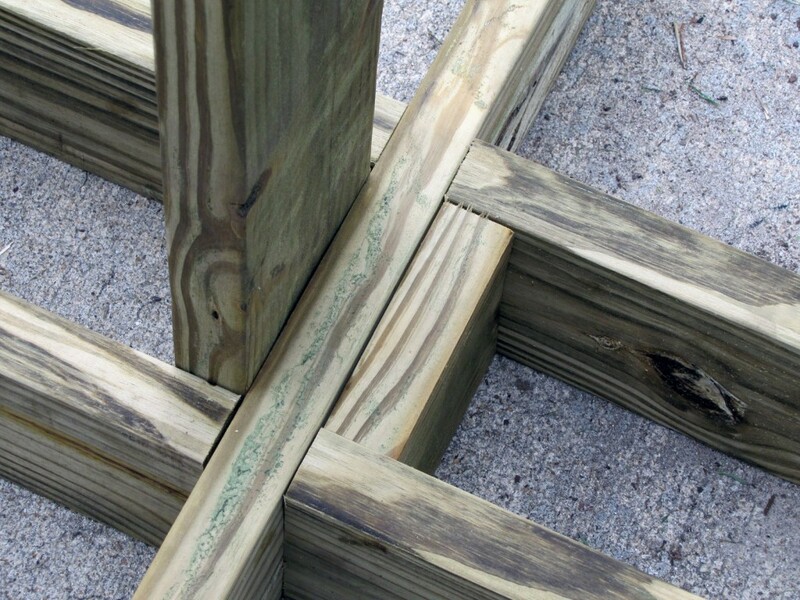 Use screws that go through at least three of the boards. Fasten the boards together from both sides (sandwich them together). I already had some screws which were a little too long; after screwing them in, I cut off the protruding tip with a cut-off disc. The walls are pretty easy. Just measure out 8' on the 1"x8"x12', and cut it. What is left over will be the side wall(s). This plan calls for a bed that is about as wide as one can manage. Any wider, and you wont be able to work the soil without getting into the bed. If you cannot be very physical, maybe make the side walls shorter, like 3' in length or less, to help with managing the garden. 1x8x12s cut once to produce 8' and 4' boards. The wall boards are really thin, and you'll be using screws near the edges of these boards, so they are prone to splitting. Find a drill bit whose width is just a bit smaller than the threaded portion of the screws you're using. Then, mark that bit (I used electrical tape) showing the width of a board. This visual aid will help you drill through the top board, but not touch the column underneath. Using this method will prevent splitting. Fasten the columns to the side boards according to the plans. I'm sure you know this, but you when you are measuring the overlap distance, it is not 1 inch... "1 inch" thick boards are more like 5/8" thick. With the short walls having columns, you can stand them up and place the long walls against them, shaping up the bed. 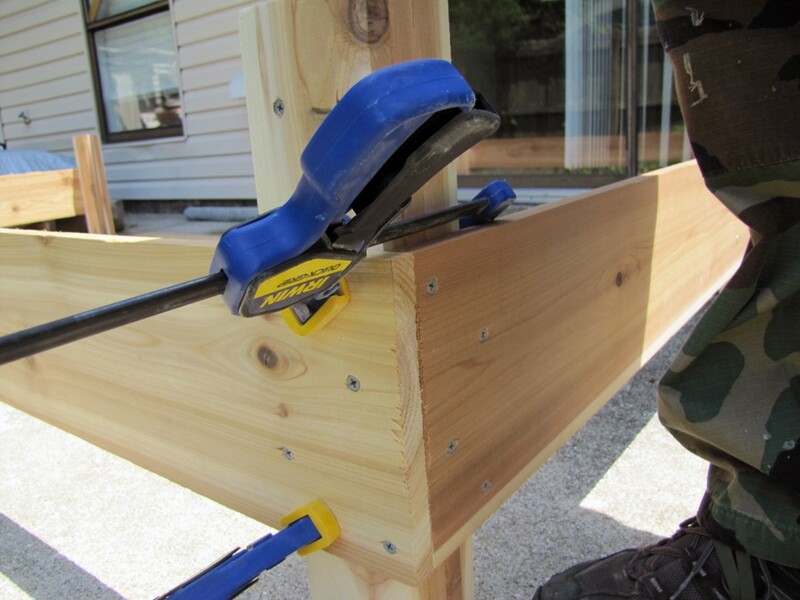 Use some clamps to get everything square, and fasten it all together. I have some decent grass in the area that I planned on putting the bed. I also have areas of the yard that do not have decent grass. Challenge accepted -- Operation transplant grass. I first placed the constructed bed exactly where I wanted it (making sure it was square, too). I then used a shovel to cut a perimeter. 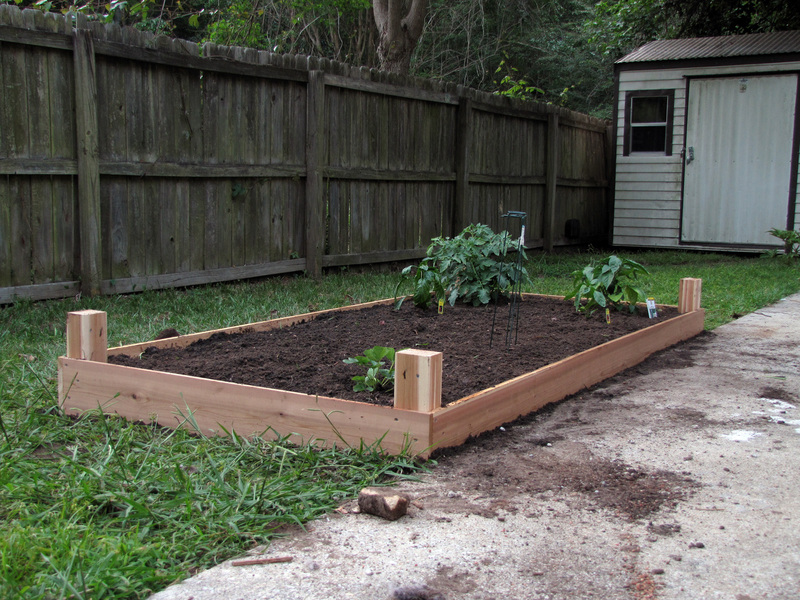 Cut the perimeter around the placed raised bed frame. Be careful, don't knock that bed out of alignment! I then cut out manageable squares of sod and moved them over to a section of the yard that I tilled earlier. I tried to balance out the concept of not removing too much soil from my bed location, but keeping enough soil on the grass / sod so I don't kill it. 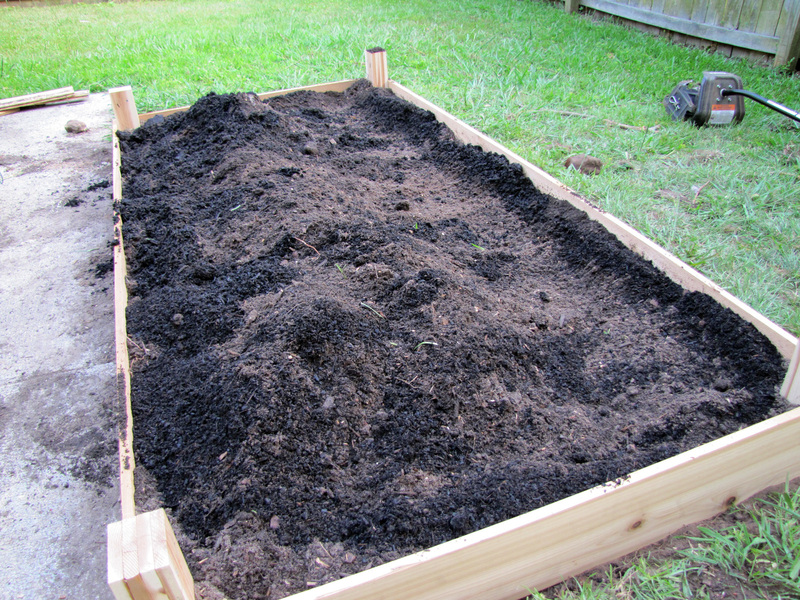 I wanted the constructed bed to sit about 2 inches lower than the grass line, so I removed all the soil to that level (placed it in a wheel barrel). I used a post hole digger to make cavities in which the posts will sit. These post holes will be the key for leveling the frame. 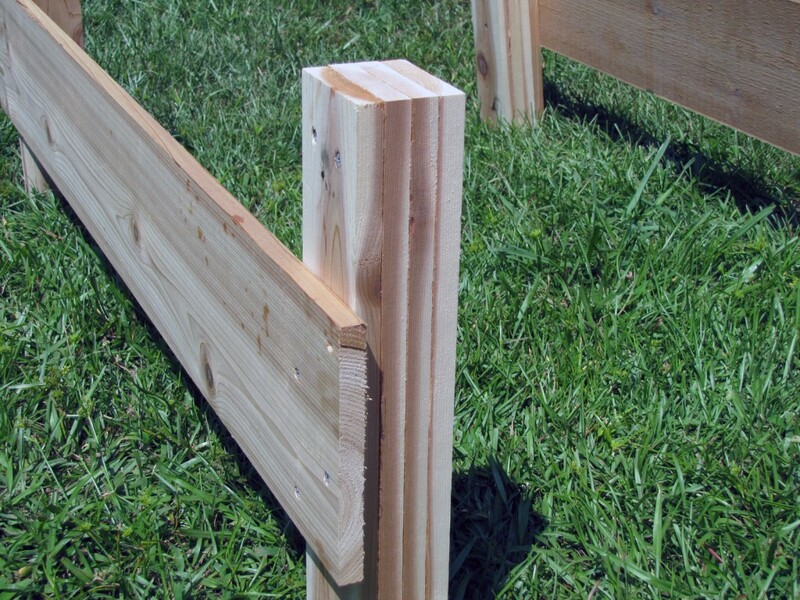 Once the frame is placed, attach a level to a side, and add/remove dirt from the post holes to level the frame. Keep compaction in mind; if you need to raise a side, add more dirt than the level needs, and then push the post down to the level. Before adding anything to the bed, I tilled the hell out of the soil already there. While I was tilling, I threw in some compost/fertilizer. 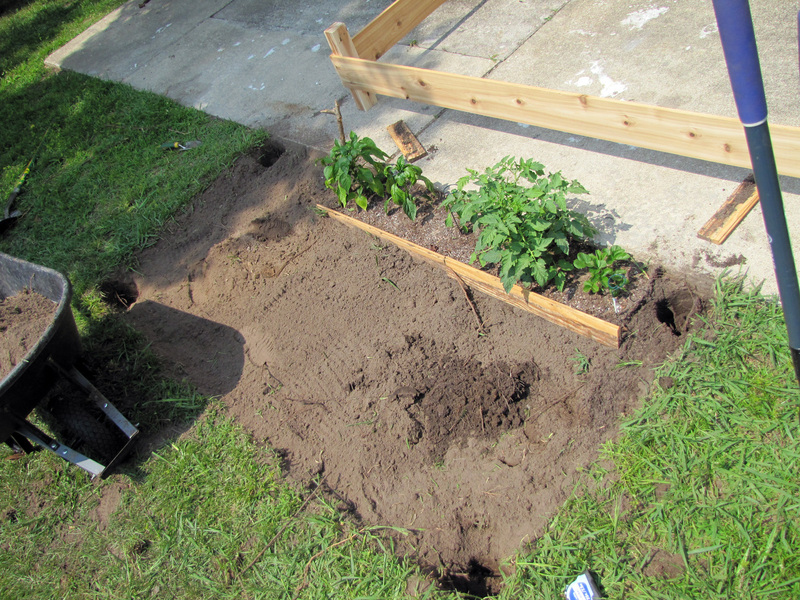 Then I added back all the soil that I removed earlier, and mixed in some store bought top soil and compost/manure. The removed soil was replaced, with some compost. That filled the majority of the volume of the frame, but not as high as I wanted. So I added some more top soil and manure, and mixed. The final product looked so rich. It was insanely fluffy too... it was tempting to just dive in and swim around in it. What is wrong with me? Damn that was a lot of work. 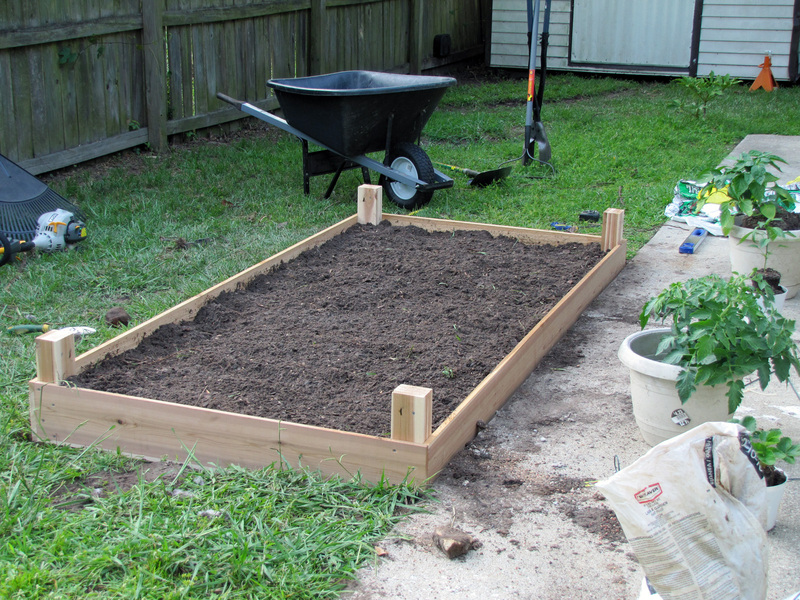 Assembling the raised bed frame was the easy part! I'd say the worse was transplanting all that grass -- I was doing that at 1pm in 87 F, southern weather. Hauling sixteen 50 lbs bags of soil and compost/manure wasn't bad, but tilling and mixing it was! I had a blast though; I love building things, and this ended up looking pretty cool. Before nightfall, I got my plants back into the bed... I hope they'll be happy. Now to figure out what else to plant!